Very Good. 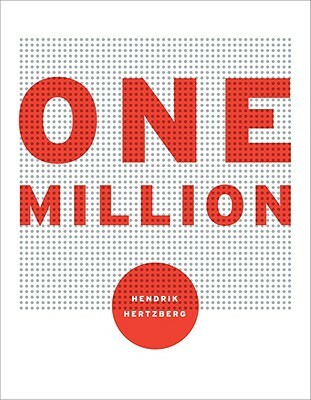 One Million by Hertzberg, Hendrik. Trade paperback (US). Glued binding. 200 p.
Very good. foxing of ends of text block. Trade paperback (US). Glued binding. 201 p. Audience: General/trade. Good. 0812920996 some shelfwear/edgewear but still NICE! -may have remainder mark or previous owner's name. Very good. Fore-edge lightly soiled. THIS IS A BRAND NEW BOOK! This particular book has a remainder mark on the bottom indicating it was a deep discounted book. Some books may have a book store price sticker on them. by Michael H Kutner, PH.D.
What a neat gimmick for a book. Two hundred pages, five thousand dots per page, one million dots in total. Each page has several marginal notes illustating some of the numbers, for example , two people in the Garden of Eden, 9,602 handgun deaths in America between 1988-90 (page 2), 63,360 inches per mile (page 13), 291,557 Americans killed in WWII (page 59), 657,000 hours of life if you live to reach 75 (page 132), 997,230 days since Isaiah preached, Homer sang and Rome was founded, as of January 1, 1993. The last is the book's only real drawback, in that many of the notes refer to the amount of time passed since some historical event or the numer of people of products produced in a particular region. But otherwise the book is filled with interesting tidbits and trivia. Open the book anywhere and see for yourself how big, and how small, one million really is.